Last week was Teacher Appreciation Week. My better half and I are both teachers. While I got nothing last week but a pay freeze and the promise of more outdoor recess duty, my fiancé was showered with wonderful gifts including flowers, fruit, candy, gift cards and this bottle of ChocoVine chocolate-flavored red wine. Now, I am not much of a drinker. You would think I would be after working with children all day, one of which recently wrote a report that stated the death penalty was legal in 48 states and illegal in the other seven, but alas I am not. I enjoy the occasional Blue Moon Belgian-Style Wheat Ale with a slice of orange while at Chili’s (I’m dripping with masculinity) but that’s about it. However, I was more than intrigued by the prospect of a chocolate wine. 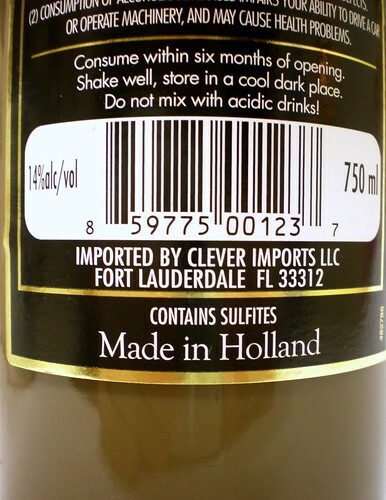 ChocoVine (horrible product name) is made in Holland by Team Products which is owned by DeKuyper and then imported by Clever Imports in Fort Lauderdale. And the bottle says Europa on it. I think the whole thing is a money laundering operation. The website for ChocoVine is absurd and awesome. It describes the combination of chocolate and wine as having “near-orgasmic” effects. Now I’ll be the first one to admit that a bottle of Sutter Home and a Hershey Bar are the perfect pairing for a quiet night of watching Beaches and crying, but I don’t think I ever came close to the aforedescribed experience. Perhaps ChocoVine will get me there. 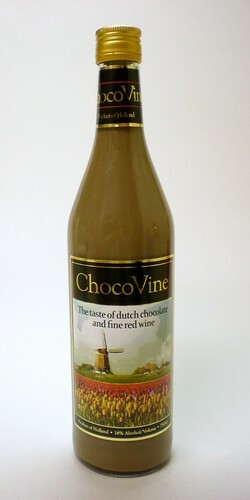 They also mention the “years of research” that went into making ChocoVine. At first I pictured a lab with a setup similar to Seth Brundle’s in The Fly. Wine in one pod and an accidental chocolaty thumb smudge on the door before it was sealed. Though upon a cursory glance at the ingredients list, apparently their research never lead them to actually using real chocolate, only artificial flavors, despite the site’s rhetoric about chocolate this and chocolate that. They even throw down with the antioxidant health stuff. Shady. And I can’t forget about the clip of ChocoVine being plugged on a Lifetime look-at-this-crazy-product-am-I-right-ladies-type show that looks like it should be playing on a TV screen in a doctor’s waiting room. The stuff smells like Bailey’s or Kahlua or some such creamy liqueur. It’s smooth and thick. It doesn’t exactly ooze into the glass but it certainly isn’t splashy. Really, it tastes like a spiked Yoo-hoo. There’s no hint of grapes or wine other than the alcohol bite, which is there, but minimal. You won’t be swirling and sniffing this looking for subtleties and nuance. If one was averse to the taste of spirits, this bottle would be an express Train to Drunktown (there may be connecting service to Vomitville, as you just consumed 25 ounces of a thick chocolatish grape-based beverage). ChocoVine seems a little low rent and is obviously a novelty. There’s nothing wrong with that. It tastes good enough. I’m sure a lot of creative drinks could be mixed up with this stuff without breaking the bank. I’d sip some on occasion. Whether I could finish a whole glass, I don’t know. If you see a bottle, get it for your next get together, if only for the conversation it will start. Oh yea, and it’s a Cabernet, if that means anything to you. I have had a bottle of this sitting in the cabinet for a year and a half now because I have been to scared to try it. Your review was helpful but I think I am still too scared to ever try it! Crack that bad boy open! Haha, I think if I can’t finish my bottle this week, it will hang around the pantry for quite some time. That is disgusting. Please tell me that the 48 + 7 states was just witty writing. Sadly that is a true story. I keep imagining that it was some sleeze-bag single dad gave who gave this to your fiancé. That or a really ballsy student. Haha! She works at a Greek school so add some chest hair and a medallion and I think you’re right on. Oh wow, chocolate & wine, this sounds different! doesnt really sound like my type of thing though, i barely even like alcohol in my chocolates! and you have the perfect gift. 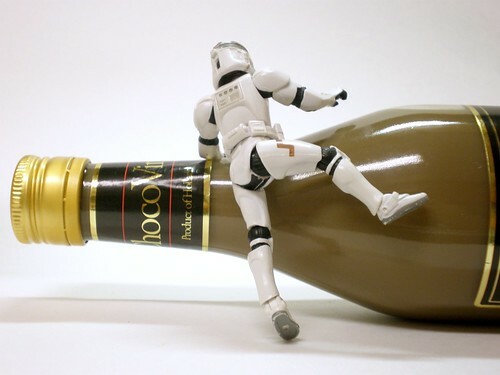 i thought it looked like yoohoo! this is disgusting. i imagine you’d get better results by letting a piece of chocolate melt in a glass of real wine. Had this on vacation & loved it. You must shake the bottle & pour over ice. This has just a HINT of the Cabernet. I’d treat it as a dessert liquor & just sip a small glass after dinner (or in a hot tub). I’ve heard it’s good over ice cream. I just received a bottle of Cocoa di Vine -Chocolate Wine- from a woman who hates me (i.e.-the mother-in-law from hell) so I thought this is most likely the worst tasting concoction in the world. However, after reading everyone’s comments, I might try it!!! If I get sick or die then my mother in law will get an extra Xmas gift this year. I got a bottle tonight to give it a try… because I do, in fact, enjoy a nice red wine with chocolates. This seems more like a cream liqueur with mild hints of chocolate and wine flavoring. However, the red wine give the cream a disagreeable grey tint. Not appealing. it’s not as bad as one would think. I have this now….and it is very reminiscent of Baileys in texture and stoutness. i put mine int he freezer and got it very chilled and just sipped. It tastes more like whisky than red wine. It would be GREAT in a cup of warm/hot cocoa! I just tried some last night for the first time and ran out and bought a bottle this morning. It was delicious and I might drink a whole bottle tonight. Will let you know if it takes me to vomitville. I really want to know the caloric value though before I do. It tastes a whole lot like Bailey’s which is kind of scary. Lots of calories there! Loved reading your article! Quite witty! It has to be high calorie! And thanks. Tried it for the first time last night. Much too sweet/syrupy for my tastes. My husband came up with spiked YooHoo as well! If there were real ingredients, I might sip a cordial glass full just because it was around, but knowing the color is just from cream mixed with red wine – oh, and the artificial colors and flavors! – it just turns my stomach. I don’t think too many folks who appreciate a nice red wine and chocolate are going to want this pseudo-blend. Great review! I HAD THIS DRINK LAST NITE FOR THE FIRST TIME AND IT WAS DELICIOUS. IF YOU HAVE ANY COUPONS FOR THIS I ‘D APPRECIATE IT IF YOU WOULD SEND SOME. I AM NOT A DRINKER BUT THIS WAS A VERY NICE AFTER DINNER DRINK. I received a bottle as a gift. I put some in my coffe as a creamer and it tastes great! Sort of like a Baily’s coffee. Enjoy! hommes et les femmes, et ils ont aussi donnerenfants vêtements. quel tend à rendreRalph Lauren vêtements remarquablede certains autresfashion lignes est ils fassiez mettre sur. avec cela, vous pouvez acquérirun détendue et égalementconfiance déplacer. corps. Si vous êtes vade fabuleuxou de gala juste en tenantune promenade sur la plage, vous ne serez jamais vous tromperavec RL vêtements. their brand new line which is made up of light sports-casual wear with preppy proportions. By using it, you can play tennis or even sip lemon tea in your veranda in style. dark blur and seaweed green with stripe and solid variations which they feature. For starters there us no such thing as Dutch Chocolate. Secondly, Holland is only 2 of the 12 provinces of the Netherlands so Im assuming they mean Holland, CA. The only reason Ive heard of this drink is because an American has asked me to bring some bottles from the Netherlands to NE. I had never heard of it and it has also never been sold here. I received a bottle for Valentine’s day in 2012. I have not opened it yet and would like to, but because of the creme in it I am not sure if its age prevents it from being drinkable. Any idea how long this last unopened? The local wine dealer said if its over a year I should toss it, and then tried to sell me another bottle….of course. Ooh I don’t know. Try a sip. Could be sketchy. I have a question. I was given a bottle of this and would like to share it with a couple of friends. What kind of snack food would I serve with this wine? I’d go with fruits that go well with chocolate. Maybe marshmallowy type stuff? Also would be good in coffee. doesn’t look appetizing but I thought it was delish! I agree with the Wine Goddess, it tastes very similar to Bailey’s, only a bit more of an alcohol “kick”. I tried it for fun with two friends who don’t really drink – we all loved it. Now I can’t find it anywhere, not even BevMo! I would love to get some more and make hot chocolate with it, or pour it over ice cream & brownies, or add banana liquor to it. 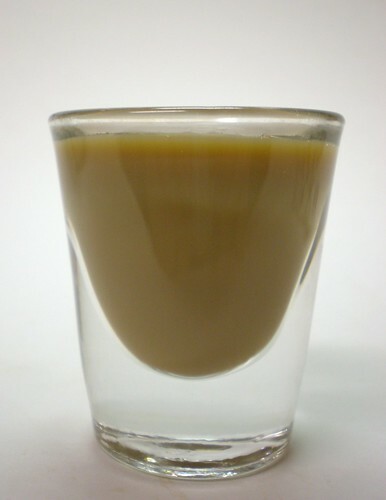 For those of you afraid to try it, don’t be – it’s really tasty (unless, of course, you don’t like Bailey’s – then you won’t like this)!